Trying to get produce that is in season is tricky in winter. The choice is rather limited so I tend to rely on the favourites of carrots and onions. To bulk out dishes I turn to tinned and dry goods. 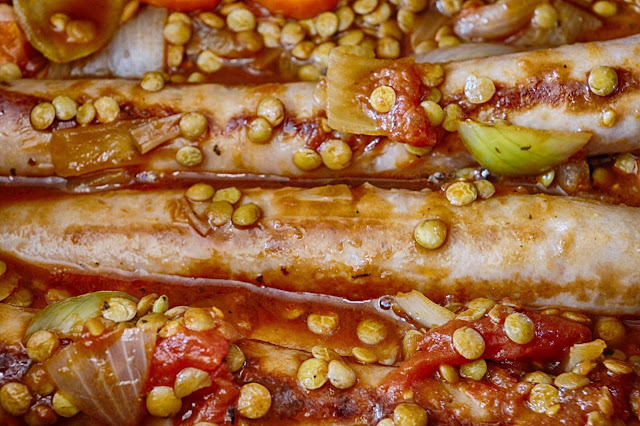 Tomatoes are one of my favourites but for this dish I've also used green lentils. Many people seem wary of lentils. You do need to make sure they are cooked enough but this simply involves boiling them rapidly for 10 minutes before letting them cook with the rest of the dish. Once cooked the lentils take on the flavours of the recipe. Pre-heat the slow cooker to HIGH. In the frying pan brown the sausages, adding the oil if required. Put the rest of ingredients in the frying pan and boil rapidly for 10 minutes. Cook on LOW for 6-8 hours or HIGH for for 4-6 hours.